When I read the title of this week’s Word Press Weekly Photo Challenge – “Silence” – it was this street photo that was immediately in front of my eyes. I know I have posted it before, but this photo is all about silence, as silent as street photography can be. 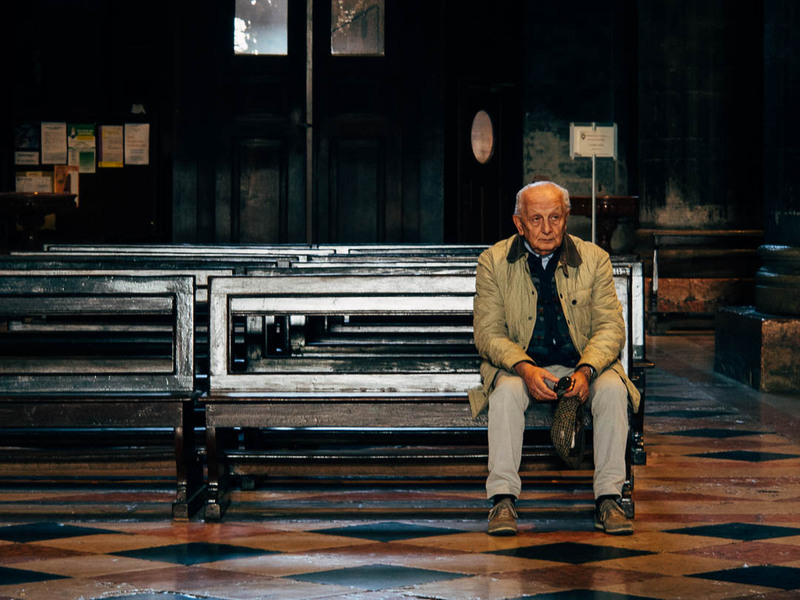 The sounds of a bustling Italian market were barely audible inside the cathedral of Cremona, where only a handful of visitors were present in this huge church that was totally silent. And then there is the silence in and around this old man that was totally lost in thoughts. Just to answer the questions that came with my earlier post of this, I shot this photograph at the long end of my small mZuiko 14-150mm F/4-5.6 telezoom (300mm full frame equivalent) and my Olympus was set to silent mode. I was standing behind a column shooting around it, so I was sure not to disturb in any way through my photography. Graet shot, for the choice of subject more than anything else. Specially striking the almost innocent, child-like gaze lost in the distance. Should spell ‘pensive’ though. I loved this photo before and I love it still!! It is a beautiful take on silence. Thank you for sharing it again Marcus. Nice capture and nice take on the prompt also. Your photo looks a still from a movie. The man has such character. His silence is potent. Nice use of available light and color. We just watched a video last night—Strad Style— that featured Cremona.